CLIP ON LIGHT - Have a Nite Ize SpotLit LED clip on light handy whenever you need a mini-beacon to light your way through the dark. A quick and easy attachment and bright, long-lasting light make it a staple for everything from daily life to overnight adventures. GREAT FOR DOGS - Lightweight and water resistant clip light makes for a perfect, all-weather dog collar charm or dog collar light for when your pup is playing out in the dark. 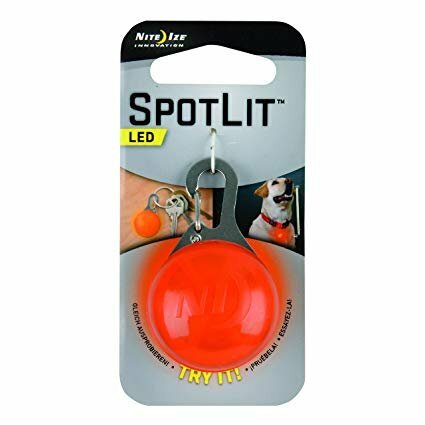 MULTI-USE - Nite Ize SpotLit LED clip on light provides an ambient glow bright enough to read, find your keys or keyhole, locate tent lines and camping gear, attach to your person for visibility, or use as a dog collar charm or dog collar light. LONG-LASTING + DURABLE - This water resistant clip light features a secure stainless steel spring clip carabiner attachment, glow and flash modes, push button switch and easily replaceable 3V lithium battery that gives you 20 hours in glow mode or 25 hours in flash mode. 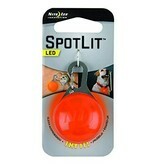 COMPACT AND EFFECTIVE - Measures 2.12" x 1.28" x .85" and weighs .56 oz., easy to use as a clip on light for a dog collar charm, dog collar light, gear or apparel light, or keychain light.